In today’s fast paced, competitive world of soccer, a common topic of debate is the best path for player development. Variables such as coaches, team performance and the player’s interest in other activities (sports, school, family, etc) vs soccer are important considerations when and how a player decides to dedicate their time to soccer. 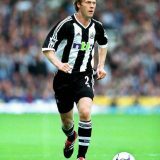 As there are many avenues to success, the right answer can be as unique as the player themselves. Two of the stars from the Del Mar Carmel Valley (DMCV) Sharks Elite Clubs National League (ECNL) program have forged similar, but relatively rare paths to their success: they both started with the sport as recreational players and both stayed within the same organization (DMCV Sharks) as they ascended from recreation to their positions on ECNL teams. 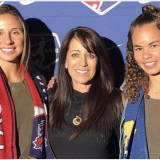 Meet Jordan Rowell, the all-ECNL, all Avocado League and US Soccer Player Development Program (PDP) selectee from Sharks G-01 (Crawford) and Mateo Pacelli, ECNL standout from Sharks B-04 (Barton) and current member of the Cal South Olympic Development Program (ODP). While enjoying time with her friends, Rowell’s skills quickly developed under the watchful eyes of her recreation coaches. In recognition of her talent, coaches annually selected Rowell for the recreation All-Star teams that went up against other top programs in San Diego. The importance of good coaching is known to all. “The Sharks philosophy is to achieve complete player development by helping players thrive in a healthy learning environment” said Shannon MacMillan, director of soccer at the Sharks. 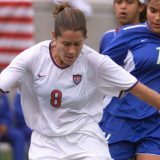 “Our coaches from recreation to the elite competitive teams strike a balance between being demanding and having fun while always maintaining their status as a role model.” MacMillan credits this approach for her rise from a recreational player in San Diego to the World Cup and Olympics. Smiling as she thought back, “My first team was the Purple Godzuckis and all I remember was how much fun it was. Its amazing how important the joy of a sport is in the development of today’s player. And the balance has worked. Rowell, who recently committed to playing for San Jose State, was part of the Cal South ODP in 2013 before her selection to the 2018 all-ECNL team, the 2018 PDP roster as well as earning all-league honors as a sophomore varsity starter for Torrey Pines this year. Pacelli, who enters Torrey Pines this fall, has been selected for the Cal South ODP program for the third straight year, putting him on the radar of numerous top programs. Although there are many suitors for their talents, both players look forward to staying with their current teams until they leave for college.